When it comes to city trips and sightseeing, Sydney in Australia is a worldwide favourite destination. Those who prefer urban travel and seek to experience the vibrant life of the largest and most populated Australian city, both during the day and at night, will surely be delighted by the views from Sydney Harbour Bridge, Luna Park and Bondi Beach. The buzzing core of all that goes on in the capital of New South Wales, that is, the shows and performances at the stunning Sydney Opera House, the dining, the shopping and the commercial activity, is at what locals frequently call Sydney Central Business District, conveniently located just eight kilometres away from the airport. The proximity of downtown Sydney to the airport terminals enables arriving travellers to commute easily and fast regardless of their chosen means of ground transportation. As a matter of fact, the range of private and public transport options is wide and includes hiring a vehicle after landing, sharing a shuttle van or taking a taxi, which will take about twenty minutes in light traffic; trains towards central Sydney depart from the airport’s railway station every ten minutes and the ride lasts approximately thirteen minutes; at least two bus routes link the Eastgardens area to Bondi Junction and Burwood via terminals 1 and 3 of SYD, while cycling and hiring a limousine are less common yet equally effective ways to travel. In view of the stated above, it would be a fairly good idea to stay close to Sydney International airport in Australia while on a short business trip or vacation, since this would undoubtedly reduce the typical stress caused by lack of time while ensuring you can get to the city centre and come back to rest in your hotel room without the need for long commutes. Otherwise, if you would rather be at the heart of the action, we are about to recommend you some of the best areas where you can find accommodation in Sydney. Declared a UNESCO World Heritage Site in 2007, the Sydney Opera House complex is the most iconic sight in the city and probably one of the most recognisable landmarks in the world. It accommodates a variety of halls and theatre venues that host internationally acclaimed shows and events all year round. 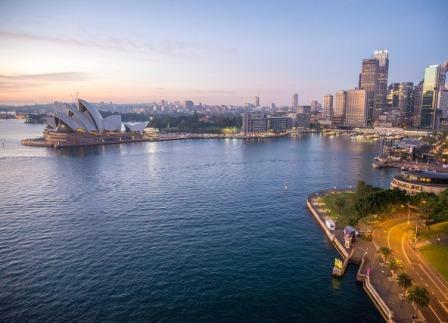 But even when you do not intend to purchase tickets for a performance, staying at Sydney Harbour only to enjoy its views can perfectly make your whole trip an unforgettable one. Moreover, it lies close to the Royal Botanic Gardens and the business district. Many urban travellers would never say no to a little bit of beach life, especially when they are fond of surf and water sports, which they can practice in Bondi. However, aside from beach-volley competitions, races, skate parks and lots of surf, Bondi Beach in Australia offers the bustling atmosphere of a bohemian tourist area with street markets, festivals, cosy cafés featuring live music, nice restaurants and seaside hotels. Should you look for a convenient, tranquil stay, with plenty of restaurants specialising in the best international cuisine around the corner, consider finding a hotel near the East Village Shopping Center in Sydney, open between 9:00 am and 5:30 pm every day of the year. Budget travellers staying in a low-cost accommodation can take advantage of its free unlimited WiFI, while travel foodies will appreciate the opportunity to try dishes from all over the world in just one place. Right on the other end of Sydney Harbour Bridge, the amusement park known as Luna Park in Sydney –Australia– is worth a visit for two main reasons: TV show and film directors consistently choose it as filming location for the spectacular setting it is plus it affords outstanding views over the bay as well as of Sydney’s skyline from the top of some of its rides. If you are taking a family trip with kids or this is the sort of attraction where you would like to spend the most of your trip, why not stay in a hotel near Luna Park? Due to its not-so-central situation, you might have a totally different Sydney experience in this area.